In habitat Near San Juan De Los Cues, Oaxaca, Mexico. Altitude: 500-2500 metres above sea level. 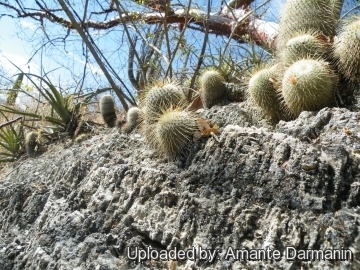 Habitat: Mammillaria dixanthocentron occours in dry tropical deciduous forest and Quercus-Pinus forest and is a facoltative saxicole that can be found either clinging on cliffs and steep rocky slopes and limestone walls and also on hills and on the shadier side, under the trees; the soil is alkaline (pH 7-8). 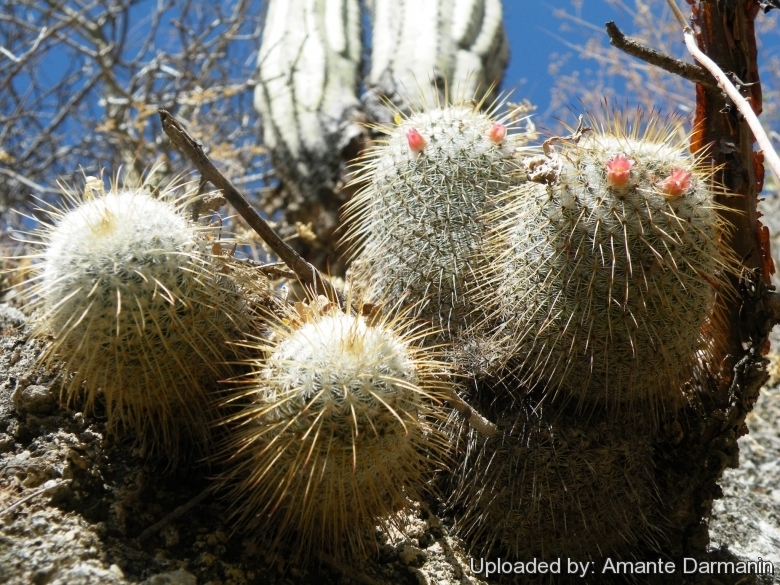 This rocky habitats harbour a rich succulent flora comprising: Pilosocereus chrysacanthus, Mammillaria carnea, Mammillaria tonalensis, Ritterocereus pruinosus, Coryphantha calipensis, Ferocactus recurvus, Neobuxbaumia tetetzo, Cephalocereus hoppenstedtii, Myrtillocactus geometrizans, Stenocereus stellatus, Stenocereus pruinosus, Opuntia decumbens, Pachycereus weberi, Pachycereus hollianus, Plumeria rubra, Ipomoea arborescens, Bursera morelensis, Jatropha spathulata, Jatropha urens, Agave marmorata, and Agave macroacantha. The species is locally very abundant. It is known from at least 21 sites, where a total population of about 350,000 mature individuals is reported. 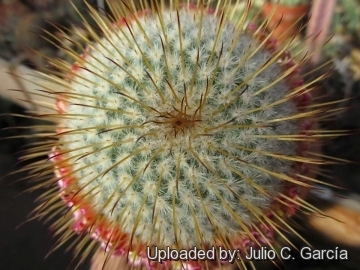 Mammillaria dixanthocentron var. flavicentra (Backeb.) Repp. 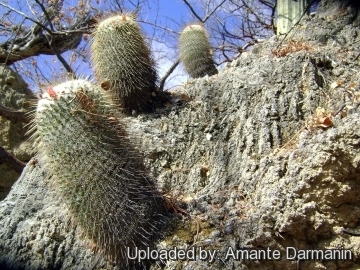 Description: Mammillaria dixanthocentron is a robust cylindrical cactus species, up to 30 cm high. with two long, yellow, central spines. 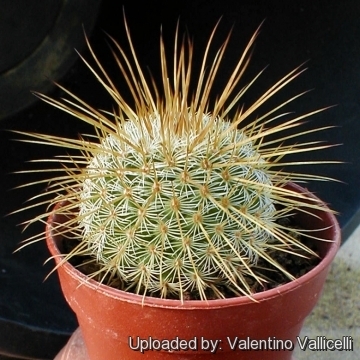 This Mammillaria with its lovely spination makes a wonderful feature plant. Habit: Plants mostly solitary unbranched or occasionally forking dichotomously at maturity. Stems: Stout, globose to short cylindrical to 20(-30) cm high, 7-8 cm in diameter. Tubercles: Cylindrical. Without latex. Tubercles-axil with scant wool at first, later with curly wool. Radial spine: 19-20, thin, white, 2-4 mm long. Central spine: 2-4, usually yellow, but also white to reddish, becoming brownish or whitish, with dark tips, upper central spine to 5 mm long, lower one up to15 mm long. 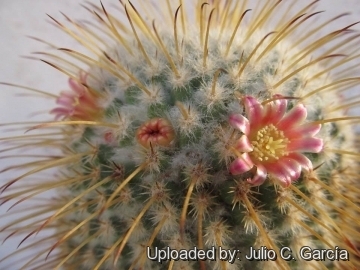 Flower: Small, 8-10 cm long and in diameter, light red to pale pinkish red. Fruit: Yellow below, orange above. 5) Arias, S., Valverde, T. & Zavala-Hurtado, A. 2013. 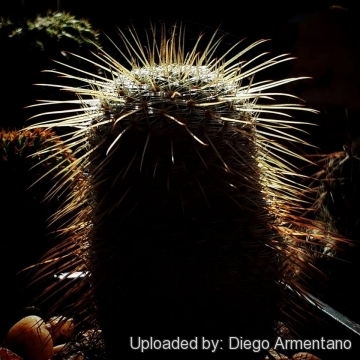 Mammillaria dixanthocentron. In: IUCN 2013. IUCN Red List of Threatened Species. Version 2013.1. <www.iucnredlist.org>. Downloaded on 13 August 2013. 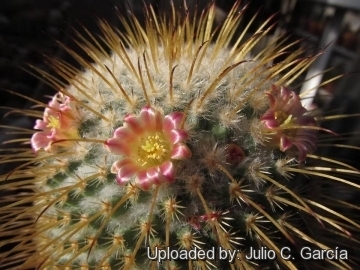 Cultivation and Propagation: Mammillaria dixanthocentron is not particularly difficult on own roots. No special cultural requirements. 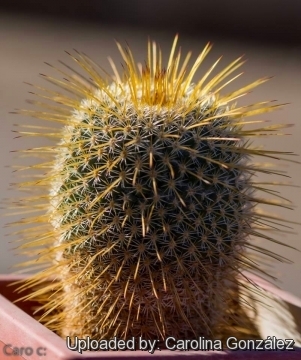 Growth rate: It is an easily flowering species and a relatively rapid grower in comparison to other spherical species, the plant will increase the number of heads by dichotomous division. Large clumps can be produced in a few years given the best conditions.